The incorporation of the Propontis islands into a historical description of Asia Minor results from the conceptual framework that defined the constitution of the Asia Minor Greeks as a subject of historiography. The islands may be regarded as part of Asia Minor mainly because of the conventional criterion of the history the Greeks living there had in common with the overall Greek-Orthodox population of Asia Minor, which is marked by the experience of the forced migration of 1922-1923, and not because of objective historical and geographical criteria. Of course, reference should be made to the communication and to some common socioeconomic characteristics between the islands and the nearby coasts of Asia Minor mainland, particularly the peninsula of Cyzicus. Already from the Byzantine years the Propontis cluster of islands was under a special ecclesiastical authority, the archbishopric of Proconnesus (or Proikonnesos), which included the island of the same name (Prokonnisos, widely known as Marmara Island), the largest of the cluster, as well as the neighbouring islands of Koutali (Ekinlik), Aloni (Paşalimani) and Afyssia (Avsa). The Ottoman conquest does not seem to have affected the survival of the above ecclesiastical province throughout history. The relative security of the sea border effectively protected the Christian population of the islands from decline during the conquest, while it later became a deterrent against the ethno-religious changes taking place in the mainland (Islamisation, settlement of Muslim population). The archbishopric of Proconnesus does not seem to have suffered the problems that generally tortured the ecclesiastical provinces of Asia Minor until the 17th century with respect to their active operation and the regular presence of a prelate. The archbishopric entered the list of bishoprics of the 15th-16th century in the first position among archbishoprics,2 although it did not appear in the patriarchal berats of the years 1483 and 1525.3 This absence could imply that the province was inactive, as the situation was in several Asia Minor provinces of the time. However, this comes in contrast to the special historical background of the Marmara Island and the rest of the Propontis islands (continuous presence of Christian population that was sufficient for the maintenance of the archbishopric). The absence of a relative reference in the two beratsmay be interpreted by analysing the documents as regards their institutional content. The appointment of the Orthodox Church as an institution of the Ottoman State brought about the respective institutional incorporation of the ecclesiastical ranks. According to the berats, the hierarchical structure of the ecclesiastical province was adopted, including dioceses, archbishoprics and bishoprics, while it is clear that berats concerned dioceses only. The absence of all bishoprics and archbishoprics, not only from Asia Minor but also from the entire Ottoman territory, explains the absence of the archbishopric of Proconnesus from both documents. The ecclesiastical province of Proconnesus appeared in the subsequent beratof 1662,4 where archbishoprics were included as well, while it uninterruptedly appeared in the following beratsand syntagmatia. The promotion of the archbishopric of Proconnesus to a diocese in 1823 was the natural outcome of its century-old autonomy under the Patriarch as an ecclesiastical province. The relatively long delay in its promotion may possibly be interpreted as the result of the relatively small number of Christians in the province. According to records published by the Athens-based Club “Anatoli” of Asia Minor Greeks with regard to the period of the early 20th century, the ecclesiastical needs of the 21,367 Greek Orthodox inhabitants of the area under the jurisdiction of the diocese of Proconnesus were covered by 26 parish churches and 33 priests.11 The priests were all described as uncultured, while the 15 schools in operation must have been insufficient. Some settlements did not even have a school, which, in combination with the above, reflects the meager financial means of the diocese. In the First World War the Christian community of Proconnesus suffered the first severe blow. In the summer of 1915 the inhabitants of the islands of Marmara, Aloni and Koutali were forcibly expelled, after they had been accused by the Ottoman authorities of provisioning the allied submarines in the Propontis. According to records, “…the entire Greek population, amounting, at very rough estimates, to 26,000 people, under the use of extreme force abandoned their homeland within a few hours and were carried by special steamships to Panormos [Bandırma], where they scattered to the towns and villages of Kermasti, Michalitsi and Apollonias in the area around the ancient Ryndakos River.”12 According to the same source, the victims of the persecution amounted to approximately 5,000. In the period 1919-1922, when the Marmara islands were under the province of the Entente Powers as a part of the Straits, the expelled population returned and the Greek social and economic activities recovered for a while, although this was abruptly interrupted in September 1922. The Moudania Armistice was followed by the evacuation of the Greek population,13 which signalled the deactivation of the diocese of Proconnesus. There is no doubt that the ecclesiastical province of Proconnesus, apart from the largest and most populated island of the same name (Prokonnisos or Marmara Island), included the rest of the nearby islands already from the Middle Ages. The incorporation of the islands of Aloni (Paşalimani) and Koutali (Ekinlik) has been evidenced already from the 17th century.14 The seat of the province was in Aloni until 1900. In the Late Ottoman period (19th- early 20th century) the geographical area under the jurisdiction of the diocese is clearly defined and included the four islands of the cluster, that is, Prokonnisos (Marmara), Aloni, Koutali and Afyssia (Avsa), the first two having more than one settlement. The vast majority of the islands’ population was Greek Orthodox, while Muslims inhabited only the Marmara Island (in the early 20th century there were also Jews). The archbishopric and subsequent diocese of Proconnesus was the administrative ecclesiastical institution of the almost exclusively Greek Orthodox population of the four islands that uninterruptedly and actively operated throughout the Ottoman period. However, the relatively small number of Christians and the limited economic development of the area affected negatively the economic opportunities and prospects of the diocese and hindered any particular distinction in social, educational and cultural fields. 1. Miklosich, F. – Müller, J., Acta et Diplomata Graeca Medii Aevi. Sacra et Profana, vol. Ι (Vienna 1860), pp. 127-128. 2. Darrouzès, J., Notitiae Episcopatuum Ecclesiae Constantinopolitanae (Paris 1981), p. 420. 3. Ζαχαριάδου, Ε., Δέκα Τουρκικά Έγγραφα για τη Μεγάλη Εκκλησία (1483-1567) (Athens 1996), pp. 114-115. 4. Κονόρτας, Π., Οθωμανικές Θεωρήσεις για το Οικουμενικό Πατριαρχείο. Βεράτια για τους προκαθήμενους της Μεγάλης Εκκλησίας (17ος-αρχές 20ού αιώνα) (Athens 1998), p. 232. 5. Γεδεών, Μ., Προικόννησος. Εκκλησιαστική παροικία, ναοί και μοναί (Constantinople 1895), p. 156. 6. Κοντογιάννης, Π.Μ., Γεωγραφία της Μικράς Ασίας. Φυσική σύστασις της χώρας, πολιτική γεωγραφία, φυσικός πλούτος (Athens 1921), p. 268. 7. Γεδεών, Μ., Προικόννησος. Εκκλησιαστική παροικία, ναοί και μοναί (Constantinople 1895), pp. 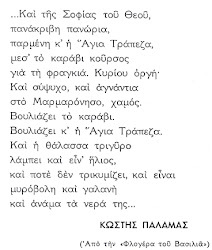 159, 192· Ξενοφάνης 6 (1909), p. 21. 8. Γεδεών, Μ., Προικόννησος. Εκκλησιαστική παροικία, ναοί και μοναί (Constantinople 1895), p. 159. 9. Γεδεών, Μ., Προικόννησος. Εκκλησιαστική παροικία, ναοί και μοναί (Constantinople 1895), p. 192. 10. Αποστολόπουλος, Δ.Γ. – Μιχαηλάρης, Π.Δ., Η Νομική Συναγωγή του Δοσιθέου. Μία πηγή και ένα τεκμήριο (Athens 1987), pp. 149-150. 11. Ξενοφάνης 3 (1905-1906), p. 190. 12. Βαλσάμης, Ε. – Λαμπαδαρίδης, Ν., Προκοννησιακά Ιστορικά (Athens 1940), p. 205. 13. Βαλσάμης, Ε. – Λαμπαδαρίδης, Ν., Προκοννησιακά Ιστορικά (Athens 1940), p. 207. 14. Γεδεών, Μ., Προικόννησος. Εκκλησιαστική παροικία, ναοί και μοναί (Constantinople 1895), pp. 156-159, 192. 15. Ξενοφάνης 3 (1905-1906), p. 190. 16. Βαλσάμης, Ε. – Λαμπαδαρίδης, Ν., Προκοννησιακά Ιστορικά (Athens 1940), p. 205. Η συμπερίληψη του χώρου των νησιών της Προποντίδας σε μια ιστορική διαπραγμάτευση με αντικείμενο τη Μικρά Ασία προκύπτει μέσα από το νοητικό πλαίσιο συγκρότησης του μικρασιατικού ελληνισμού ως ιστοριογραφικού αντικειμένου. Τα νησιά αυτά μπορούν να θεωρηθούν μέρος του μικρασιατικού χώρου, κυρίως λόγω του συμβατικού κριτηρίου της κοινής ιστορικής τύχης του εκεί ελληνικού πληθυσμού με το σύνολο των Ελλήνων της Μικράς Ασίας, που οριοθετείται από την εμπειρία της βίαιης μετοικεσίας του 1922-1923, και όχι τόσο από αντικειμενικά ιστορικά και γεωγραφικά κριτήρια. Δε λείπουν βέβαια η επικοινωνία και ορισμένα κοινά κοινωνικοοικονομικά χαρακτηριστικά ανάμεσα στα νησιά και στον εγγύτερο σε αυτά παράλιο χώρο της καθαυτό μικρασιατικής χώρας, ιδίως στην Κυζικηνή χερσόνησο. Ήδη από τη Βυζαντινή εποχή το νησιωτικό σύμπλεγμα της Προποντίδας υπαγόταν σε ιδιαίτερη εκκλησιαστική αρχή, την αρχιεπισκοπή Προκοννήσου (ή Προικοννήσου), που ενσωμάτωνε την ομώνυμη και μεγαλύτερη νήσο του συμπλέγματος (περισσότερο γνωστή με τη λαϊκή ονομασία Μαρμαράς), καθώς και τα παρακείμενα νησιά Κούταλη, Αλώνη και Αφυσσία. Η οθωμανική κατάκτηση δε φαίνεται να επηρέασε την ιστορική συνέχεια της παραπάνω εκκλησιαστικής επαρχίας. Η σχετική ασφάλεια που παρείχε το θαλάσσιο σύνορο εξασφάλισε την επιβίωση του χριστιανικού στοιχείου στα νησιά αυτά χωρίς σημαντική φθορά, κατά τη φάση της κατάκτησης, και στη συνέχεια αποτέλεσε ανασχετικό παράγοντα απέναντι στις εθνοθρησκευτικές μεταβολές που παρατηρούνται στον ηπειρωτικό χώρο (εξισλαμισμοί, εγκατάσταση μουσουλμανικού πληθυσμού). Έκτοτε, η αρχιεπισκοπή της Προκοννήσου δε φαίνεται να υπέστη την προβληματική κατάσταση που γενικά χαρακτήριζε τις εκκλησιαστικές διοικήσεις του μικρασιατικού χώρου μέχρι το 17ο αιώνα σε σχέση με την ενεργή λειτουργία τους και την τακτική παρουσία αρχιερέα. Αυτή καταγράφηκε στην επισκοπική λίστα του 15ου-16ου αιώνα, στην πρώτη θέση τάξεως μεταξύ των αρχιεπισκοπών,2 όχι όμως και στα πατριαρχικά μπεράτια των ετών 1483 και 1525.3 Η απουσία αυτή θα μπορούσε να οδηγήσει στην υπόθεση της ανενεργής διοίκησης σε αναλογία με την τότε δεδομένη κατάσταση πολλών μικρασιατικών επαρχιών, έρχεται όμως σε αντίθεση με το ειδικότερο ιστορικό πλαίσιο σε σχέση με το Μαρμαρά και τα άλλα νησιά της Προποντίδας (σταθερή παρουσία χριστιανικού πληθυσμού που επαρκούσε για τη συντήρηση της αρχιεπισκοπής). Η απουσία σχετικής αναφοράς στα δύο μπεράτιαμπορεί να ερμηνευτεί μέσα από την ανάλυση των εγγράφων ως προς το θεσμικό τους περιεχόμενο. Η ανάδειξη της ορθόδοξης Εκκλησίας σε θεσμό του Οθωμανικού Κράτους επέφερε την αντίστοιχη θεσμική ενσωμάτωση των εκκλησιαστικών οφφικίων. Όπως προκύπτει από το κείμενο των μπερατιών, σεαυτά υιοθετήθηκε η ιεραρχική διάκριση των εκκλησιαστικών διοικήσεων σε μητροπόλεις, αρχιεπισκοπές και επισκοπές, και είναι σαφές ότι αυτά αφορούν μόνο τις πρώτες. Η απουσία καταγραφής κάθε άλλης επισκοπής, ακόμα και αρχιεπισκοπής, όχι μόνο του μικρασιατικού χώρου αλλά από το σύνολο της οθωμανικής επικράτειας, εξηγεί την μη αναφορά της αρχιεπισκοπής Προκοννήσου στα δύο αυτά έγγραφα. Η εκκλησιαστική διοίκηση Προκοννήσου καταγράφηκε στο μεταγενέστερο μπεράτι του 1662,4 στο οποίο συμπεριλήφθηκαν και οι αρχιεπισκοπές, και στη συνέχεια η καταγραφή της ήταν σταθερή στη σειρά μεταγενέστερων μπερατιώνκαι συνταγματίων. Η προαγωγή της αρχιεπισκοπής Προκοννήσου σε μητρόπολη το 1823 ήρθε ως φυσικό επακόλουθο της μακραίωνης αυτόνομης υπό τον Πατριάρχη υπόστασής της ως εκκλησιαστικής επαρχίας. Η σχετικά μεγάλη καθυστέρηση της προαγωγής αυτής μπορεί πιθανότατα να εξηγηθεί ως απόρροια του σχετικά μικρού ποιμνίου της επαρχίας. Σύμφωνα με στοιχεία που δημοσίευσε ο Σύλλογος Μικρασιατών «Ανατολή» και αναφέρονται στην περίοδο των πρώτων ετών του 20ού αιώνα, οι 21.367 ελληνορθόδοξοι κάτοικοι του χώρου αρμοδιότητας της μητρόπολης Προκοννήσου καλύπτονταν εκκλησιαστικά από 26 ενοριακούς ναούς και 33 ιερείς.11 Το σύνολο των ιερέων χαρακτηρίζονται ως απαίδευτοι, ενώ ο αριθμός των 15 σχολείων που λειτουργούσαν μπορεί να θεωρηθεί μάλλον ανεπαρκής. Σε μερικούς οικισμούς μάλιστα δεν υπήρχε καν σχολείο, δεδομένο που σε συνδυασμό με τα παραπάνω αντικατοπτρίζει τα μάλλον πενιχρά οικονομικά μέσα της μητρόπολης. Κατά τον Α΄ Παγκόσμιο Πόλεμο η χριστιανική κοινότητα της Προκοννήσου δέχτηκε το πρώτο σοβαρό πλήγμα. Το καλοκαίρι του 1915 οι κάτοικοι των νήσων Μαρμαρά, Αλώνης και Κουτάλης εκδιώχθηκαν βίαια, αφού κατηγορήθηκαν από τις οθωμανικές αρχές ότι τροφοδοτούσαν τα συμμαχικά υποβρύχια στην Προποντίδα. Παραδίδεται ότι: «…ολόκληρος ο ελληνικός πληθυσμός ανερχόμενος κατά τους μετριωτέρους υπολογισμούς σε 26.000 ψυχάς εγκατέλειπεν εντός προθεσμίας ωρών υπό τας επιταγάς ανηκούστου βίας τα πάτρια εδάφη και δι’ ειδικών ατμοπλοίων μετεφέρετο εις Πάνορμον, εκείθεν δε διεσκορπίζετο εις τας παρά τον αρχαίον Ρύνδακον ποταμόν πόλεις και χωρία Κερμαστήν, Μιχαλήτσιον, Απολλωνιάδα».12 Σύμφωνα με την ίδια μαρτυρία τα θύματα του διωγμού ανέρχονται σε περίπου 5.000. Κατά την περίοδο 1919-1922, όταν τα νησιά του Μαρμαρά τέθηκαν κάτω από τη διοίκηση των δυνάμεων της Αντάντ ως τμήμα της ζώνης των Στενών, σημειώθηκε επιστροφή του εκτοπισμένου πληθυσμού και σχετική ανάκαμψη της κοινωνικής και οικονομικής δραστηριότητας του ελληνικού στοιχείου, η οποία όμως διακόπηκε απότομα το Σεπτέμβριο του 1922. Την υπογραφή της συμφωνίας των Μουδανιών ακολούθησε η εκκένωση του ελληνικού πληθυσμού,13 γεγονός που σήμανε και την απενεργοποίηση της μητρόπολης Προκοννήσου. Δεν πρέπει να υπάρχει αμφιβολία ότι η εκκλησιαστική επαρχία Προκοννήσου, πλην του ομώνυμου, μεγαλύτερου και πιο πολυπληθούς νησιού (Προκόννησος ή Μαρμαράς), περιλάμβανε ήδη από τη Mεσαιωνική εποχή και τα υπόλοιπα κοντινά νησιά. Τουλάχιστον για τα νησιά Αλώνη και Κούταλη η ενσωμάτωσή τους μαρτυρείται ήδη από το 17ο αιώνα.14 Στο νησί της Αλώνης μάλιστα βρισκόταν και η έδρα της επαρχίας μέχρι το 1900. Κατά την όψιμη Οθωμανική περίοδο (19ος-αρχές 20ού αιώνα) ο γεωγραφικός χώρος αρμοδιότητας της μητρόπολης καταγράφεται με σαφήνεια και συνίσταται από τα τέσσερα νησιά του συμπλέγματος, Προκόννησο (Μαρμαρά), Αλώνη, Κούταλη, Αφυσσιά, τα δύο πρώτα με περισσότερους από έναν οικισμούς. Η συντριπτική πλειονότητα του πληθυσμού των νησιών ήταν ελληνική και μόνο στο Μαρμαρά υφίστατο τουρκικό στοιχείο (στις αρχές του 20ού αιώνα μαρτυρείται η παρουσία και εβραϊκού πληθυσμού). Η αρχιεπισκοπή και κατόπιν μητρόπολη Προκοννήσου αποτέλεσε το θεσμό εκκλησιαστικής οργάνωσης του σχεδόν αποκλειστικά ελληνορθόδοξου πληθυσμού των τεσσάρων νησιών του Προκοννησιακού συμπλέγματος με αδιάλειπτη ενεργή λειτουργία καθ’ όλη τη διάρκεια της Οθωμανικής περιόδου. Το σχετικά μικρό μέγεθος του ποιμνίου όμως και η περιορισμένη οικονομική ανάπτυξη του χώρου επέδρασαν αρνητικά στις οικονομικές δυνατότητες και προοπτικές της μητρόπολης και δεν της επέτρεψαν να σημειώσει κάποια ιδιαίτερη διάκριση στο χώρο της κοινωνικής, μορφωτικής και πολιτιστικής πολιτικής.